EDesign: Painted Maple Cabinets – A Gorgeous Off-White Makeover! You are here: Home / My Projects / Kitchen Remodel and Design / EDesign: Painted Maple Cabinets – A Gorgeous Off-White Makeover! Seriously, nothing makes me happier than ‘after’ photos flowing into my inbox. Well, except wine, wine makes me happy. Oh, and Ryan Reynolds, he makes me happy too. Combine wine, Ryan and some after photos and it’s a GOOD NITE in the Mawdsley house (maybe not for Tim). 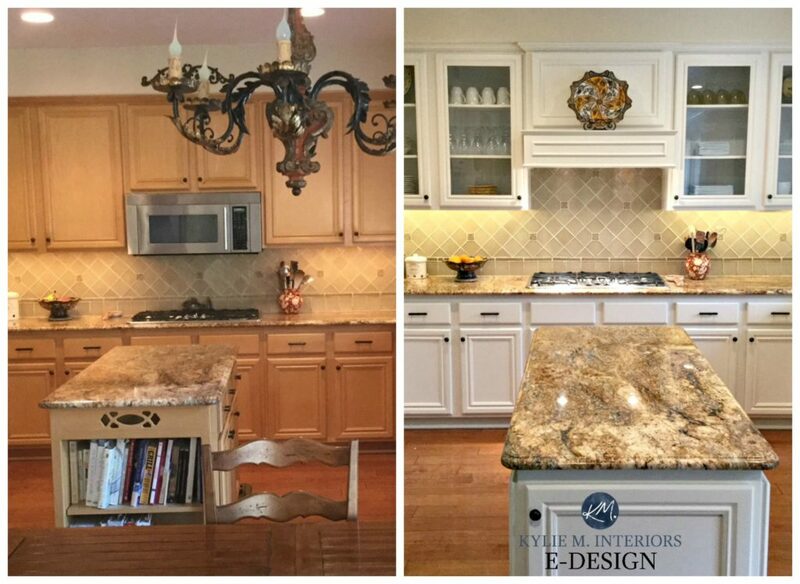 So, when my Edesign client sent photos of her painted maple cabinets it was definitely time for celebration – WHAT a transformation! And after…can I get an AAAAAMEN! And after – fresh, clean and simple. The cabinet colour is BM White Down via my Cabinet Paint Colour Package ($65). 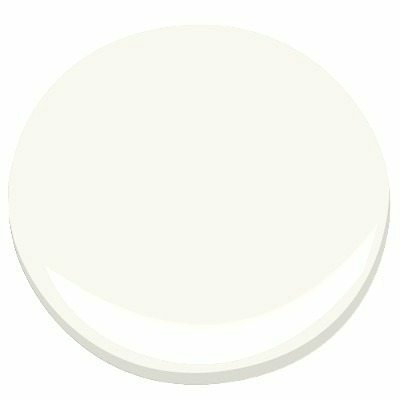 White Down is an off-white that is warm and creamy with a neutral base that calms it down, so it isn’t OVERLY yellow/creamy. For the ceiling, she chose SW Alabaster which looked gorgeous with her existing paint colour, Valspar Pawnee, which seems to be similar to BM Putnam Ivory. LOOOOVE that backsplash and the orderly cabinet display! And Claudius – classic cat move, trying to steal the show. So what do you think, would YOU have done the same? Or more to the point, would your HUBBY do the same – we know how weird those hubs are about their wood (no pun intended…okay, maybe a bit intended). Looking for ideas to update YOUR kitchen? Check out my affordable and fun E-design and Online Paint Color Consulting packages! Beautiful! The colors are totally on point. I love it! And what is it about men and wood anyway ( also not intending it to be a pun). Can someone explain to me how to get past this obsession? I know! I mean I get it, there are SOME woods that are amazing, that it would be a shame to paint. However, there are some that aren’t doing any GOOD as WOOD. I’ve said it before and I’ll say it again, ‘Just because it’s wood, doesn’t mean it’s good! I think they need to see before and afters like this, to see how it can look and how it can add VALUE to their home! I have 11 year old light cherry cabinets and would LOVE to paint them but hubby is adamant about it not happening. Ugh! May I make a suggestion? 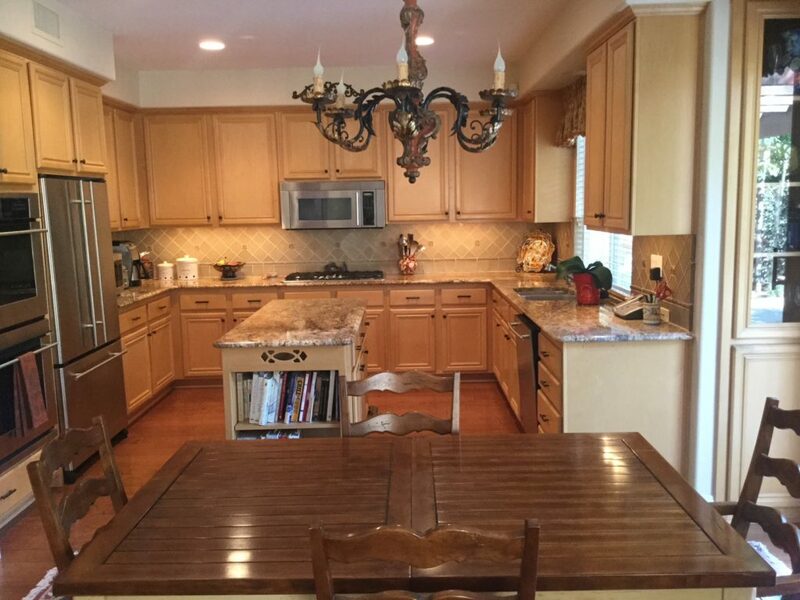 Paint the hood and/or the island base cabinets… for a trending 2-tone effect. When your hubby sees how great it looks, he will be on board with painting the rest of the cabinets for the unified, 1-color look you really want. Baby steps! Gorgeous! Is BM White Down on the walls too? Nope! It’s a colour that is similar to BM Putnam Ivory, a Valspar colour…and thank you! Ooo yes Amy, I see you coming up on my to-do list – exciting! And yes, I’m TOTALLY feeling the ‘no microwave’ thing – they are never beautiful! Lovely. On another note, I hope the frazzled woman I met in Sherwin Williams took my advice and asked for your advice on paint colors. I think she was 2 paint chips shy of a full meltdown! Knowing she was on her third quest to find the right colors, I strongly urged her to contact you. She was very receptive to the idea so I hope she followed through. I knew she would not be disappointed. Well I hope so too Valerie and THANK you for telling her about me – that’s what makes my world go round! Love the re-do…but where are you now hiding your microwave? Beautiful transformation. How long did it take to complete the project and how labor intensive was it? I have had cabinet people tell me that laquered maple cabinets cannot be painted. Is this true in your experience? 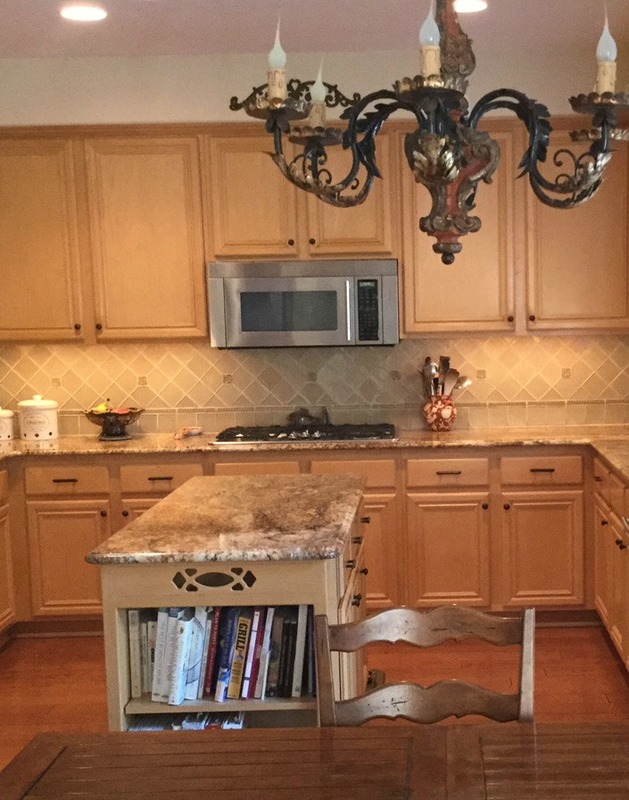 Were these cabinets professionally painted or did the homeowners tackle it themselves? And that’s a good question, but i’m SURE its professional, I would NOT advice doing it DIY as maple is so smooth, there is really no room for error – professional spraying is definitely best! Our paint and cabinet work took about 2 weeks. It took an additional week to create the hood cover, glass cabinet doors, led overhead and under cabinet lighting and ceiling painting. Our cabinets are about 20 years old so they are not perfect. Some of the cabinet doors are slightly warped but no one would ever notice. I only realized this myself right before we began the project when one of the bidding contractors pointed it out. The contractor we selected also painted my maple master bath cabinets white for my gray and white bathroom 3 years ago so I knew they did good work. I only wish I knew of Kylie then when I was struggling to find the right shades of white and gray paint! The procedure they followed included several steps of sanding and painting. They also applied a tiny line of caulking between the door moulding and panels to prevent cracking or gapping. I am thrilled with how it turned out and love the color Kylie recommended. My husband still can’t figure out why we needed to paint perfectly good maple cabinets, argh! At least he’s happy that I’m happy. I seriously thought I was going to have a nervous breakdown trying to figure out the right white. Thank goodness I found Kylie! Wow, super clean, bright and very impressive! I love before and after pics.., Thanks for sharing. Lovely transformation! But just where IS the microwave? The microwave is on the counter near the refrigerator so it is no longer center stage. Yes…Sadly I am in the same position with the maple cabinets. Mine are very pretty, if one liked maple cabinets…and my husband does! But I am in the market for new counter tops and back splash. I am thinking that this back splash color would look pretty even if I have to stay with the maple cabinets. What do you think? Yes, I love the low contrast, simple look of it – it’s gorgeous! Thanks Kylie for sharing ALL the whites used in this makeover! So often a wall and/or trim is shared but not the ceiling and ceiling color (to my thinking!) can be the trickiest. 10 years ago I thought an over the range microwave was the best idea ever and invested in a combo vent hood/convection oven/microwave in our new build. After 8 years of living with highly inefficient venting, accumulation of cooking oil on microwave, the obtrusive box (visually & physically), we ditched that wretched appliance. I love how much more open and brighter (and cleaner!) the space is with the new vent hood! Happily, I found a out of sight solution for a great little microwave. Hi Jane! If you find my search area (in the side bar) and type in wood cabinets, you should find several articles! Most of them focus on oak, but there are still some great ideas for wood tones!